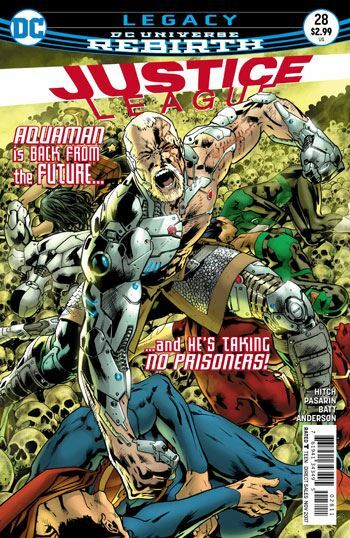 Hitch and Pasarin continue in high gear with the latest issue of Justice League. This ought to be a fairly low key chapter. 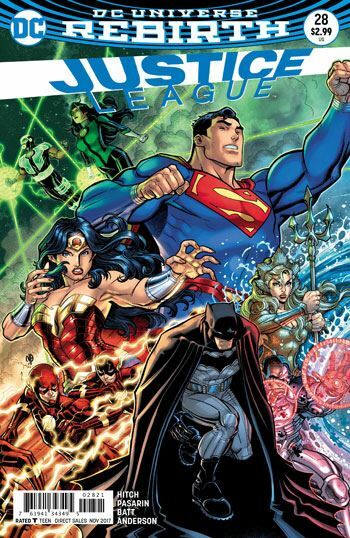 The children of the Justice League members spend virtually the entire issue getting to know their parents. This is all emotion and character building instead of heavy drama and action. It’s also the best single issue of the run so far. A lot of thought went into the creation of these new heroes, and that is apparent in the widely varied interactions that we see. Some of the members of the League are delighted with their newly discovered offspring, others find the situation more of a challenge. Hunter is at the core, the abandoned son of Wonder Woman. While it is fascinating to see how he interacts with Superman, who effectively raised him in the future Hunter grew up in, this leaves Wonder Woman as the one parent completely off to the side. Well, ok, Green Lantern Simon Baz is also shunted to the side, not being the parent of any of the kids, but that allows for some plot building in his cutaway scene. But keeping Wonder Woman to the side is far more important to the overall flow of the story. Her character is always so open and compassionate, it’s fascinating to see her cope with, and accept, the accusation that she would have no interest in her own baby if it were born male. This also winds up thrusting Wonder Woman into the role usually played by Batman in Justice League stories, the loner off investigating, finding out more than the rest of the team about the current situation, and the biggest threat that will need to be overcome. There is a strong twist at the end. Not really a twist, the groundwork for it is well laid. But it still bodes for a dramatic next issue. And I am just so glad to finally be enjoying this book.